California-based Renown Auto Style has released some jazzy images of its Sidewinder body program to suit the (R230) Mercedes-Benz SL-Class. The aero package, which results in a Roadster that is ten inches wider than the SL 65 Black Series and an inch wider than Lamborghini’s Murcielago, comprises of a front bumper with large intakes, ventilated hood, monster front fenders, side skirts, full rear quarter panels, and an expanded rear bumper with air outlets and diffuser section. Optional upgrades include a front bumper lip, side skirt vents, diffuser and rear wing, all constructed from carbon fibre. A choice of wheels are on offer, such as the company’s 20-inch R10S-C rims in 10.5 and 13-inch widths. 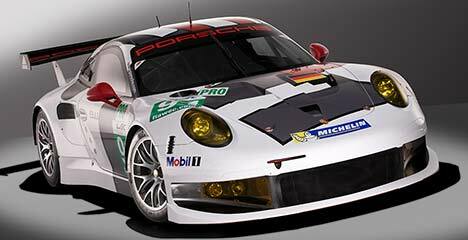 Porsche has released details of the new 911 RSR racecar, based on its 991 generation model. Larger than its predecessor, and with a lower centre of gravity and better weight distribution, the 991 RSR utilizes carbon fibre for its front and rear wheel arch extensions, doors, underbody, rear wing, and quick-release front lid and rear panel. The material was also used to construct the dashboard and centre console. Other weight-saving measures include the use of polycarbonate for the windows and a lithium-ion battery. The same 338 kW/460 hp 4.0-litre unit that saw service in last year’s 911 GT3 RSR has been retained for the 991, with gears in the six-speed transmission being changed via flappy paddles on the steering wheel. Other features include a new wishbone front suspension set-up, which replaces the previously used McPherson struts, while deep cooling air intakes at the front of the car feed the brakes and centrally-mounted radiator. Set to compete at this year’s 24 Hours of Le Mans and in the World Endurance Championship, two cars will be fielded in the GTE category by Porsche AG Team Manthey, with Olaf Manthey in the role of team manager. Porsche works drivers Richard Lietz and Patrick Pilet shared driving duties at the Florida circuit. Lietz will take part in the WEC as well as Le Mans with Marc Lieb in car number 92, while Pilet joins forces with Joerg Bergmeister in the number 91 vehicle. It will celebrate its race début on April 14 at the WEC season-opener in Silverstone. This new video from evo sees the magazine’s road test editor, Henry Catchpole, heading to the Italian hills for an epic group test involving the Lamborghini Aventador, Ferrari’s F12 and an Aston Martin Vanquish. All three models use V12 engines, with the Lamborghini needing 6.5-litres to create 515 kW (700 hp), the Ferrari developing 544 kW (730 hp) from its 6.3 litres and the Aston Martin some way behind with its 421 kW (565 hp) 6.0-litre unit. 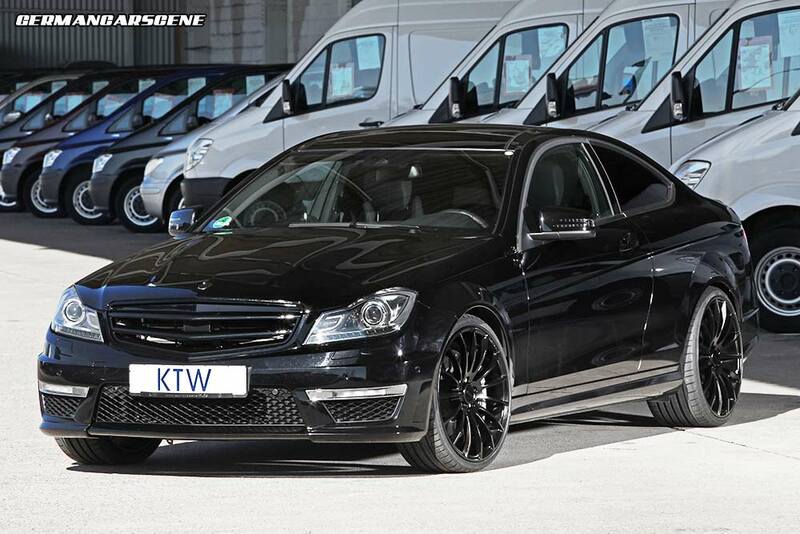 KTW Tuning in Hildesheim has released details of its new Mercedes-Benz C 63 AMG Coupe program. The company fits Brabus’ B63 S performance upgrade, which comprises of remapped ECU software, new air filters and high-flow catalysts, meaning output from the 6.2-litre V8 rises from 341 kW (457 hp) and 600 Nm of torque to 390 kW (530 hp) 650 Nm. On the road 100 km/h appears in 4.1 seconds, while the V-Max has been disabled allowing a 315 km/h (195 mph) top speed. Visually, the factory wheels have made way for a set of black Tomason TN9 items, which measure 8.5 and 10 x 20 inches and wear 235/30 and 275/25 tyres. Tinted windows and a Vaeth de-badged grille completes the aesthetics. The complete package is priced at €6,599. Giessen-based tuning specialist Leib Engineering has revealed its understated GT 500 program to suit the current BMW M3 Coupe. Visually, the Alpine White model wears carbon fibre mirror casings, a trunk lid lip and front apron flaps from the BMW Performance program, while the original wheels have made way for a set of powder coated BMW 220M forged rims, which measure 8.5 and 9.5 × 19-inches and come wrapped in 235/35 and 265/30 Michelin Pilot Sport Cup tyres. Moving inside, the BMW Performance seats and steering wheel are trimmed in Alcantara. Swish. The performance upgrade begins with a stainless steel exhaust system featuring a 100-cell HJS catalyst, an X-pipe with centre silencers and a rear silencer with vacuum-controlled flaps. The sonancy of the system can be controlled by the driver via the car’s M button. The new exhaust releases 20 kW (27 hp) from the naturally aspirated 4.0-litre V8 engine, with a remapped ECU taking total output to 345 kW (470 hp) – up from 309 kW (414 hp). Chassis enhancements include a Brembo GT braking system which comprises of 380 mm front discs gripped by six-piston calipers and 320 mm discs with four-piston items on the rear. The stainless steel KW DDC ECU coilover set-up can be adjusted via the EDC buttons, through the pre-selection in the M drive menu or even via the free KW DDC iPhone app. Revised ABS software reduces braking distances, while tweaks to the dual-clutch transmission’s electronics minimizes gear change times. Audi has officially revealed the Sedan version of its A3 model along with a bunch of images. Essentially a booted variant of the 4.46 metre-long A3 Sportback, with 425 litres (15.01 cubic feet) of cargo capacity, the Sedan is designed to compete with the likes of Mercedes’ compact CLA-Class, sharing the same MQB platform as its siblings along with powerplants including a 90 kW (121 hp) 1.4-litre TFSI, a 132 kW (177 hp) 1.8-litre TFSI and a 110 kW (148 hp) 2.0-litre TDI for the diesel fans. All engines are mated to the standard 6-speed S tronic transmission. Moving to the company’s flagship model, the quattro-equipped drivetrain from the S3 Sportback is utilized, meaning a revised version of the previous S3’s 2.0 TFSI four-cylinder unit with dual injection and a cylinder head with integrated exhaust manifold, which develops 221 kW (300 hp) and 380 Nm of torque. 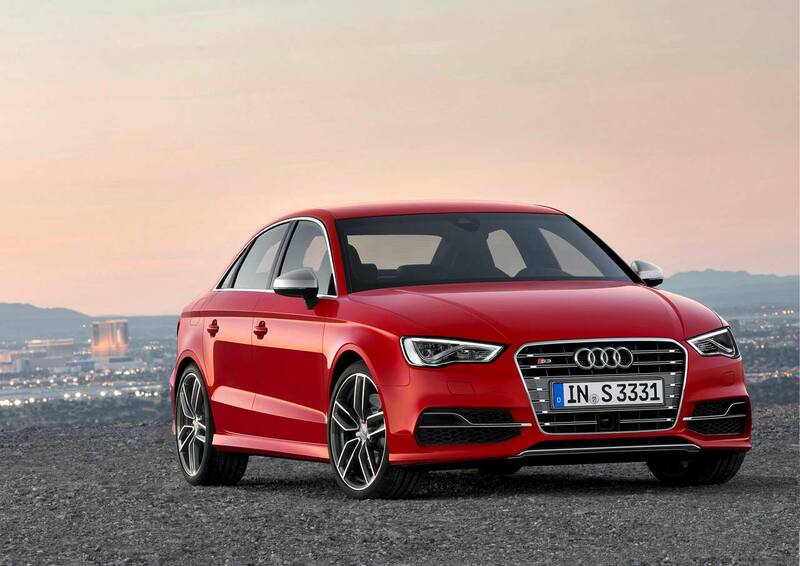 On the road the S3 hits 100 km/h in 4.9 seconds (manual 5.3s), while top speed is limited to 250 km/h (155 mph). A combined fuel consumption of just 6.9 litres every 100 kilometres (S tronic 7l/100 km) is possible, with CO2 emissions working out at 159 or 162 grams per km. Visually, the S3 sits 25 mm lower than its regular counterpart and is tastefully understated, with defining features including 7.5 x 18-inch alloy wheels wrapped in 225/40 low rolling resistance tyres, an aluminium-look S-specific grille with double horizontal bars with matte Platinum Grey insert, integrated air inlets with aluminium-look double ribs in the front bumper and aluminium-look mirror casings, while the rear gets an integrated boot lid spoiler, LED tail-lights and four oval tailpipes shrouded by a Platinum Grey diffuser.